1Department of Nursing, Kyoto Koka Women’s University, Kyoto, Japan; 2College of Health and Human Science, Osaka Prefecture University, Osaka, Japan; 3Division of Health Sciences, Graduate School of Medicine, Osaka University, Osaka, Japan. Mild cognitive impairment (MCI) is a relatively recent term used to describe people who have some memory problems, but do not actually have dementia. In recent years, some drug treatments that can improve the symptoms of Alzheimer’s disease (AD) have become available [1,2]. Other treatments that may slow down the progression of AD in the brain are also being developed. It is important that people with AD be identified as early as possible, so that they can benefit from these treatments in the future. Identifying people with MCI is one way to try to achieve this. Moreover, Basic activities of daily living (ADL) are self-maintenance abilities such as dressing or bathing . ADL questionnaires play an important role in assessing the functional abilities of older adults and evaluating the impact of cognitive impairment on routine activities . However, it is difficult to assess activities of daily living (ADL) impairment among elderly women with mild cognitive impairment (MCI) using existing scales [4,5]. Moreover, these scales do not allow for detailed assessment of ADL. This study aims to examine the relationship between cognition and ADL in elderly women with MIC. Table 1. Logistic-regression analysis result that MIC of a dependent variable in 2004-2005. ADL was adjusted for age in the analysis. Finally, it was Ethics Approval of this study, because the questionnaire was self-administered, participant’s privacy was ensured and others were not aware of their responses. Responses remained anonymous to study investigators through the use of unique identifiers for each questionnaire. Participants were asked to return the completed questionnaire in the sealed envelope provided. The study received approval from the human subject’s ethics committee at Osaka University. Participants’ mean age was 78.2 ± 6.5 years old. The age range of participants was 65 to 97 years old. Associations were not statistically significant between cognitive function and family structure. 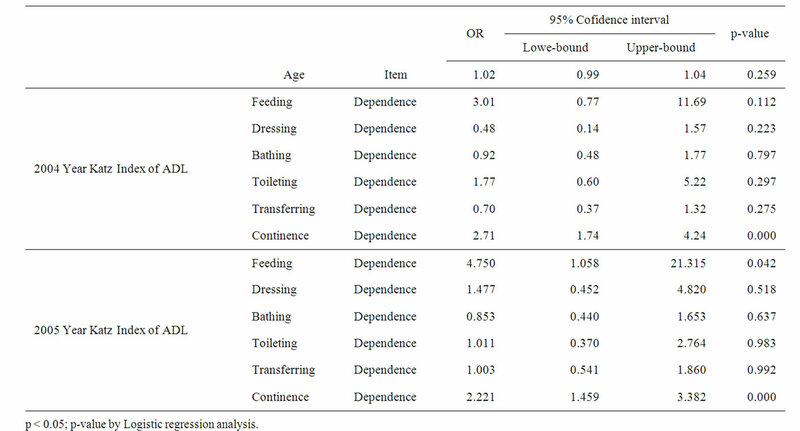 However, associations were significant for ADL items involving excretory failure (OR = 3.5, p = 0.000 in 2004, OR = 2.9, p = 0.000 in 2005; p < 0.05) using a logistic regression analysis adjusted for age (Table 1). These results suggest that ADL involving excretory failure are associated with elderly women with MCI living in the community. This results similar to articles in Japan . This type of problem may be difficult for others to recognize. Women has feel shame when seeking assistance regarding excretory problems . Furthermore, elderly women also may feel shame when seeking assistance regarding excretory problems [9,10]. Therefore, we recommend that nurses work to educate the public about treatment-adjusted dementia in the community, teaching family members or caretakers to observe the ADL of the elderly, being watchful for unusual excretory habits, extra clothes, or the smell of elderly persons’ dirty clothing. The authors are very grateful to all the respondents from the participants.